The government’s National Flood Resilience Review (NFRR) has been published this week, along with a Property Level Resilience Report. You can read it here. The review looks at how the country can be better protected from future flooding and extreme weather. The government launched the review last December following Storm Desmond, which caused severe flooding in Cumbria, Lancashire and the North East, when record-breaking amounts of rain fell - over 340mm in 24 hours in Cumbria. Storm Eva followed in late December which saw more flooding in Lancashire, Greater Manchester and Yorkshire and reinforced the need for a review of how resilient we are as a country to flooding. The NFRR looks at the effects of flooding on communities and the impacts on infrastructure, for example, electricity distribution, telecommunications and water supply. completing an assessment of our own flood risk assets and identifying where measures to improve their resilience are needed. Although strategic in nature, the review has focused heavily on actions to improve resilience ahead of this winter. As a result of the review, we have invested £12.5 million in temporary flood defences, water pumps and incident command vehicles. These will be stored in strategic locations across the country, so that they can be quickly deployed wherever and whenever there is a need. This investment is in addition to the £2.5 billion already being invested in more traditional flood assets. There has been talk this week about trying to defeat nature as people have responded to the review. I’d rather we try and work with, not against nature. There is much that can be achieved if we work together, across a catchment, to reduce flood risk. This was one of the key outcomes from the Cumbria Flood Action Plan which you can see here. But that does lead to a difficult conclusion when looking into managing flood risk. If you live in the natural flood plain of a river you will be at risk of flooding. We will do all we can to reduce the risk of flooding – a forgotten fact from last winter was that nearly 25,000 properties were protected from the floods, which would have more than doubled the number of families affected. The investment of £2.5 billion over the next few years will increase flood protection to another 300,000 homes. But this will only reduce the risk of flooding, not eliminate that risk completely. No country – not even the Dutch – claim to have eliminated flood risk. Work out what you would do if you got a flood warning – find out how to write a simple plan here. Together the Environment Agency, communities and other partners will be better prepared this winter, and we will work tirelessly to reduce flood risk in this country. But when the floods come we all need to be ready to act together. Do have a read of the resilience report and let me know what you think. Winter Ready - You don't even have an operational yard for the worst affected area - West Yorkshire and the Calder Valley! Whats your plan to make that area 'winter ready' this year when they don't have an operational depot? Hi Victoria, thanks for your comment. Before the Thorne Depot was closed, we relocated to a site at Old Moor which gave us immediate access to the depot there. We also have satellite sites in West Yorkshire to help our teams store essential equipment. 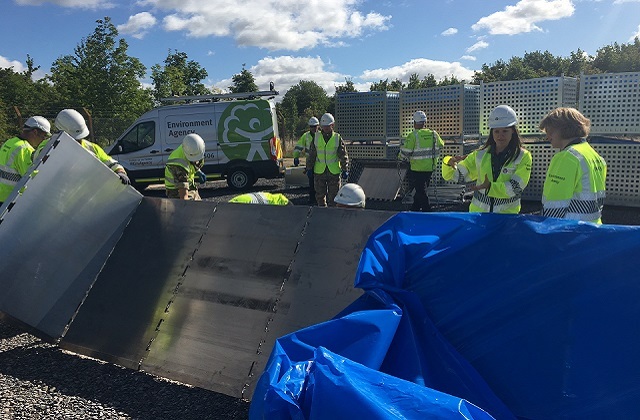 A permanent site nearby to Old Moor is nearly ready for us to move into but in the meantime we’ve ensured that our ability to respond to incidents has not been affected.